Summit County is an urban county in the U.S. state of Ohio. As of the 2010 census, the population was 541,781 making it the fourth-most populous county in Ohio. Its county seat is Akron. 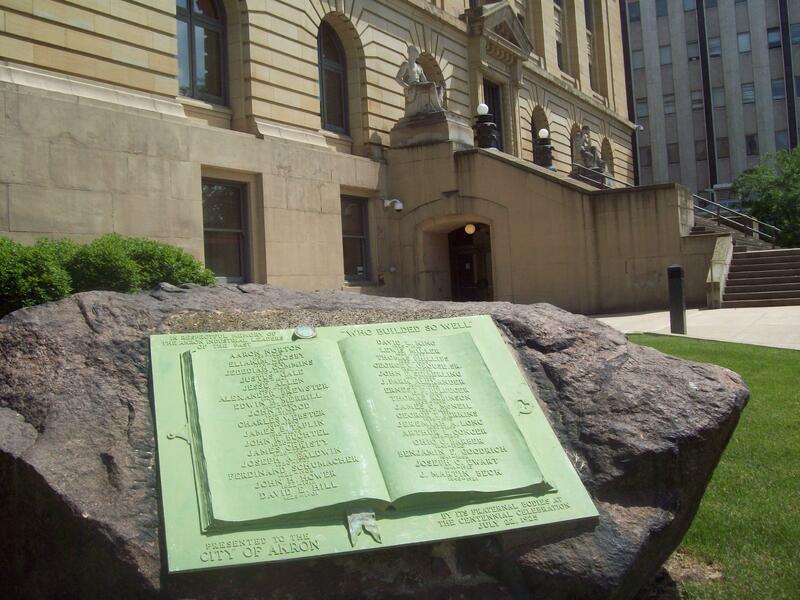 The county was formed on March 3, 1840, from portions of Medina, Portage and Stark Counties. It was named "Summit County" because the highest elevation on the Ohio and Erie Canal is located in the county. Summit County is part of the Akron, OH Metropolitan Statistical Area, which is also included in the Cleveland-Akron-Canton, OH Combined Statistical Area. According to the U.S. Census Bureau, the county has a total area of 419.38 square miles (1,086 km2), of which 412.08 square miles (1,067 km2) is land and 7.3 square miles (19 km2) (1.7%) is water. The largest portion of Cuyahoga Valley National Park is located in the northern part of the county. The southern border of the former Connecticut Western Reserve passes through the southern part of the county, leading to jogs in the east and west borders of the county. As of the 2010 census, there were 541,781 people, 222,781 households, and 141,110 families residing in the county. The population density was 1,312.6 people per square mile (508/km²). There were 245,109 housing units at an average density of 559 per square mile (216/km²). The racial makeup of the county was 80.6% White, 14.4% Black or African American, 0.2% Native American, 2.2% Asian, 0.02% Pacific Islander, 0.5% from other races, and 2.1% from two or more races. 1.6% of the population were Hispanic or Latino of any race. 24.6% were of German, 15.4% Irish, 9.6% English, 9.2% Italian, and 5.3% Polish ancestries according to Census 2010. 93.6% spoke English and 3.1% spoke another Indo-European language as their first language. There were 222,781 households out of which 27.0% had children under the age of 18 living with them, 45.3% were married couples living together, 13.6% had a female householder with no husband present, and 36.7% were non-families. 30.0% of all households were made up of individuals and 10.8% had someone living alone who was 65 years of age or older. The average household size was 2.39 and the average family size was 2.98. The median income for a household in the county was $47,926, and the median income for a family was $60,849. The per capita income for the county was $26,676. About 13.8% of the population were living below the poverty line. In 2000, the county population was spread out with 25.00% under the age of 18, 8.20% from 18 to 24, 29.60% from 25 to 44, 23.00% from 45 to 64, and 14.10% who were 65 years of age or older. The median age was 37 years. For every 100 females there were 92.90 males. For every 100 females age 18 and over, there were 89.30 males. As of the 2010 United States Census, there were 541,781 people, 222,781 households, and 141,110 families residing in the county. The population density was 1,312.6 inhabitants per square mile (506.8 /km2). There were 245,109 housing units at an average density of 593.8 per square mile (229.3 /km2). The racial makeup of the county was 80.6% white, 14.4% black or African American, 2.2% Asian, 0.2% American Indian, 0.5% from other races, and 2.1% from two or more races. Those of Hispanic or Latino origin made up 1.6% of the population. In terms of ancestry, 24.9% were German, 15.3% were Irish, 10.6% were English, 10.1% were Italian, 5.1% were Polish, and 4.5% were American. Of the 222,781 households, 29.8% had children under the age of 18 living with them, 45.3% were married couples living together, 13.6% had a female householder with no husband present, 36.7% were non-families, and 30.0% of all households were made up of individuals. The average household size was 2.39 and the average family size was 2.98. The median age was 40.0 years. The median income for a household in the county was $47,926 and the median income for a family was $62,271. Males had a median income of $47,892 versus $35,140 for females. The per capita income for the county was $26,676. About 10.0% of families and 13.8% of the population were below the poverty line, including 19.8% of those under age 18 and 8.0% of those age 65 or over. Summit is a heavily Democratic county, only voting Republican in the 49 state sweeps by Richard Nixon and Ronald Reagan in 1972 and 1984 respectively. School Districts in Summit County do not strictly follow City and Township Corporation limits or township borders. Many School Districts in Summit County overlap community borders. Below is a list of all public school districts in Summit County, Ohio. Map of Summit County, Ohio With Municipal and Township Labels. The map denotes New Franklin and Franklin Township as separate entities, predating their 2003 merger. ^ "Ohio County Profiles: Summit County" (PDF). Ohio Department of Development. http://www.odod.state.oh.us/research/FILES/S0/Summit.pdf. Retrieved 2007-04-28. ^ "Summit County data". Ohio State University Extension Data Center. http://www.osuedc.org/profiles/profile_entrance.php?fips=39153&sid=0. Retrieved 2007-04-28. ^ a b "State & County QuickFacts". United States Census Bureau. http://quickfacts.census.gov/qfd/states/39/39153.html. Retrieved February 11, 2015. ^ McCarthy retired on June 30, 2007. "McCarthy, 67, Turns New Corner,". Akron Beacon Journal, 30 June 2007. ^ a b c "DP-1 Profile of General Population and Housing Characteristics: 2010 Demographic Profile Data". United States Census Bureau. http://factfinder.census.gov/bkmk/table/1.0/en/DEC/10_DP/DPDP1/0500000US39153. Retrieved 2015-12-27. ^ "Population, Housing Units, Area, and Density: 2010 - County". United States Census Bureau. http://factfinder.census.gov/bkmk/table/1.0/en/DEC/10_SF1/GCTPH1.CY07/0500000US39153. Retrieved 2015-12-27. ^ "DP02 SELECTED SOCIAL CHARACTERISTICS IN THE UNITED STATES – 2006-2010 American Community Survey 5-Year Estimates". United States Census Bureau. http://factfinder.census.gov/bkmk/table/1.0/en/ACS/10_5YR/DP02/0500000US39153. Retrieved 2015-12-27. ^ "DP03 SELECTED ECONOMIC CHARACTERISTICS – 2006-2010 American Community Survey 5-Year Estimates". United States Census Bureau. http://factfinder.census.gov/bkmk/table/1.0/en/ACS/10_5YR/DP03/0500000US39153. Retrieved 2015-12-27. ^ "Map of School Districts near Akron, Ohio". AkronOhioMoms.com. 2013-05-29. http://www.akronohiomoms.com/life-family/schools-education/do-you-know-how-to-compare-school-districts-near-akron-ohio/. Retrieved 2014-06-05. This page uses content from the English language Wikipedia. The original content was at Summit County, Ohio. The list of authors can be seen in the page history. As with this Familypedia wiki, the content of Wikipedia is available under the Creative Commons License.